On Monday, The Dreamvision company unveiled some very ambitious plans for their Fort Worth, Texas park. 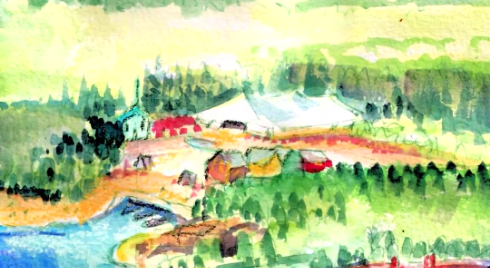 Those plans included a huge mountain that will house a massive indoor ski resort. Wednesday, we got the rest of the story as the Dreamvision Company unveiled plans for their Muscle Shoals Alabama Park. The new park will be built in what the company calls the Music hit capital of the world, and will focus on that industry and inspiration that music provides. Dreamvision Soundscape will open with Dreamvision Dreamscape in 2020, at a cost of $3.5 billion-EACH. It’s a big number, and has many wondering if it will happen. From a personal standpoint, there 8th a lot to be skeptical about, but the honesty and real attitudes have me convinced that yes, these folks will see this dream become a reality. Of course, time will tell. The real story is the theme park itself. 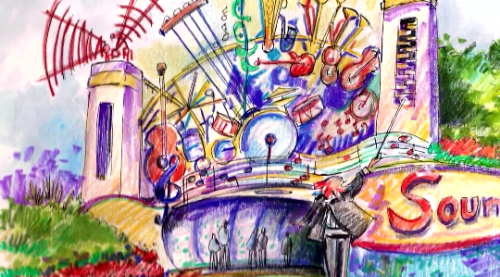 Dreamvision Soundscape will be centered around music. Music is the international language that everyone speaks, so with that the park will incorporate many different styles of music. 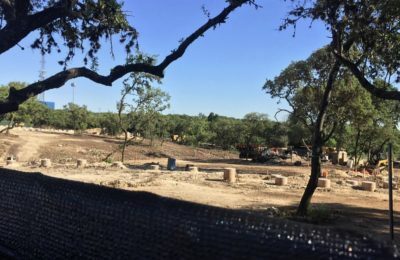 Like the Texas park, Soundscape will incorporate a huge area, 1,400 acres of land. It will also have guests enter through a village which will include shopping, dining and entertainment. Music will be all over the place with live concert venues, performers and more. 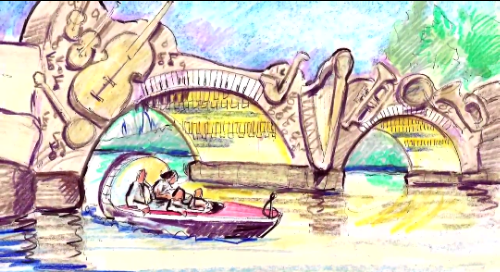 Guests will walk across a musical bridge that will have instruments embedded in it. As guests walk, each piece of music will play, conducting the theme of Soundscape. The centerpiece of Soundscape will be Soundscape Mountain. 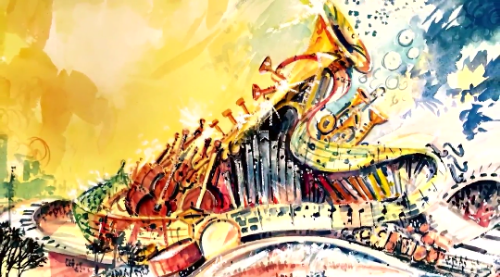 The giant sculpture will not only represent each instrument used in the score for the park, but will also be the new home of the Alabama Music Hall of Fame, which will be an all new interactive location. The area surrounding the mountain will be the main street area called Americana Blvd. The area will be a tribute to America, filled with music. The area will also be home to the parades and nighttime shows that will happen as well. Of course thrill rides and attractions will also be part of the experience, and Soundscape will boast one of the most interactive coasters where guests can actually ride the music. The music will speed up as the coaster speeds up as it careens through Soundscape Mountain. That’s right, it’s going to go through the mountain. 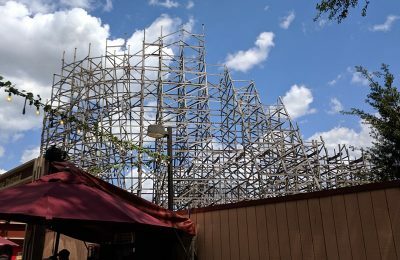 There will be a smaller, slow paced coaster that also goes through the mountain as well. Another huge attraction will be a Drive In theater themed attraction, which will take guests on a musical journey that sounds just like The Great Movie Ride. 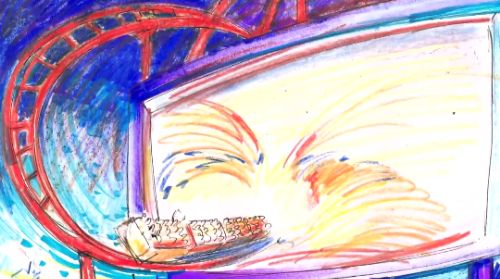 The ride will use classic car themed ride vehicles that will enter the screen one at a time. It will tell the musical history and influence that Muscle Shoals has had on the world. Another amazing new interactive rode will be a bumper car style rode where guests ride in musical notes. 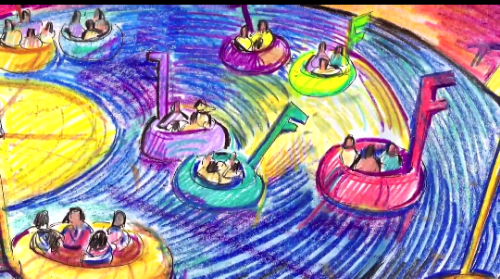 The floor will spin and the ride vehicles will dance to the music on a giant vinyl record. The music will get faster as the record spins at different RPM’s. Other areas of the park include Rockopolis where the streets will light up, Jazz Alley which will feature. Frank Sinatra themed lounge, and a country section. Speaking of Country, that section will feature a Dixie Stampede type restaurant that will blast with country music and be themed to the old west. Another area will feature gospel, and include a revival tent themed restaurant with southern favorites. Dreamscape had the indoor ski resort, Soundscape has an indoor beach. 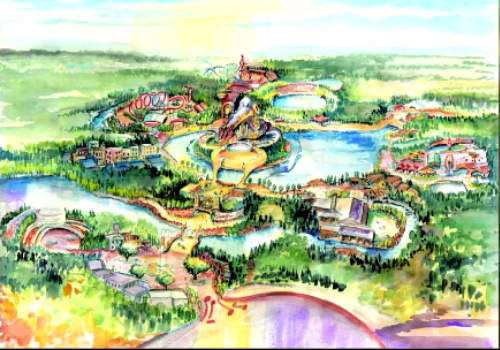 The huge area will feature a huge shoreline, waterpark attractions and thrill rides. 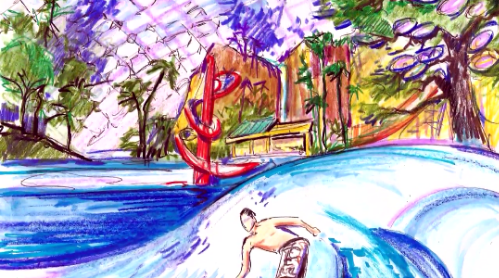 Guests will be able to surf and swim in the natural ocean pool. 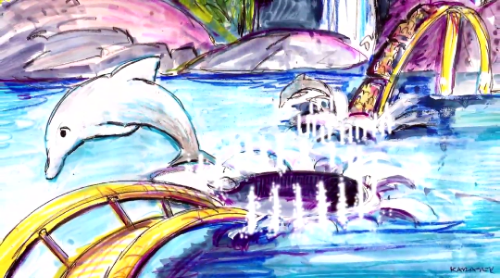 While no specific rides were mentioned, there is a piece of concept art that shows a coaster going through a tunnel in the water, with a dolphin jumping over it. With an area this big, it will be no surprise to see some marine life mixed in with the other attractions. This is park just seems to be a much more ambitious, laid back version of what Hard Rock Park wanted to be. 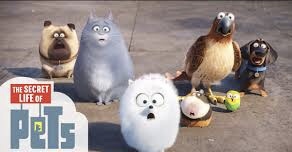 This version seems like there will be less emphasis on properties and more emphasis on styles. It’s definitely a very ambitious project, one that we will follow closely. See the announcement and concepts for Dreamvision Dreamscape in Texas by clicking here! Stay tuned for more from Dreamvision, and be sure to get social with us on Facebook and follow along with us onTwitter @BehindThrills for the latest updates! For more information about the Dreamvision Company visit the official website by clicking here!